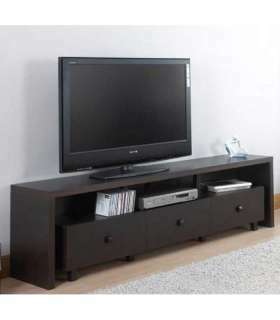 Elegant Television Cabinet colour Wenge of modern and minimalist design with high quality finish with three lower drawers, characterized by its great capacity and attractive handles in a square shape with relief that make game with the color of the furniture. This beautiful furniture can combine you perfectly with any of the products that we offer in our shop and always at the best price. The set measures: 180 w x 39 d x 51 cm high.